The vBookz PDF Voice Reader app for iOS is specifically aimed at dyslexic readers, but will also be of interest to others with accessibility. It is also a useful tool for those creating accessible PDFs and looking to go beyond simply testing with screen readers. 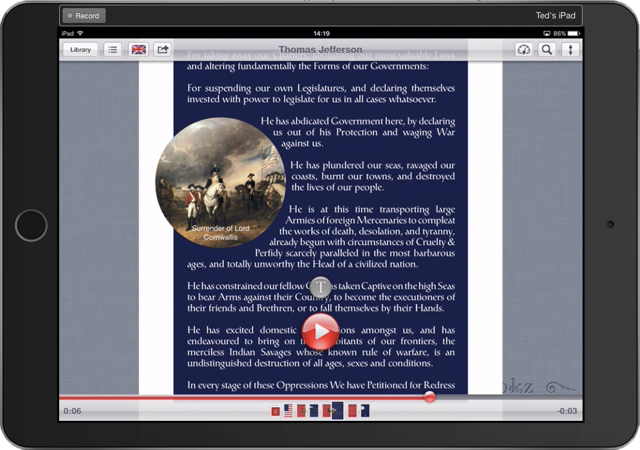 PDFs can be opened from email, or downloaded from Dropbox or Google Drive. The app’s most important features are text-to-speech, zoom and “Text mode“, which is similar both ZoomText and SuperNova’s DocReader modes. On tapping the middle of the screen a large Play button will appear. Tap once to toggle text-to-speech on or off. The speed of reading is adjustable from 100 to 500 words per minute with optional highlighting of each word as it’s voiced. Options are set by tapping the Settings “tin can” in the app’s Library. Another handy feature in this mode is that you can crop the page to avoid reading out loud headers and footers. In total, vBookz PDF Voice Reader offers 16 language options: Czech, Danish, Dutch, English UK, English US, Finnish, French, German, Italian, Norwegian, Polish, Portuguese, Portuguese Brazil, Russian, Spanish and Swedish. I tested the app using both the English UK and French voices, and both worked well. However, unfortunately, the app is not able to switch automatically between languages within a document. The zoom facility works much the same as any other: either double tap or pinch to zoom in or out. For those who need a larger text size than the simple zoom facility allows, the app provides a “Text mode”. This is similar to both ZoomText and SuperNova’s DocReader modes (but at a fraction of the price). To enter Text mode tap the button labelled “T” above the Play button (it will change to an open book icon). Text mode reflows the text into a single column and strips out any images. It also changes the font to Dyslexie as well as providing various foreground/background colour combinations of black, grey, white, blue and light yellow. 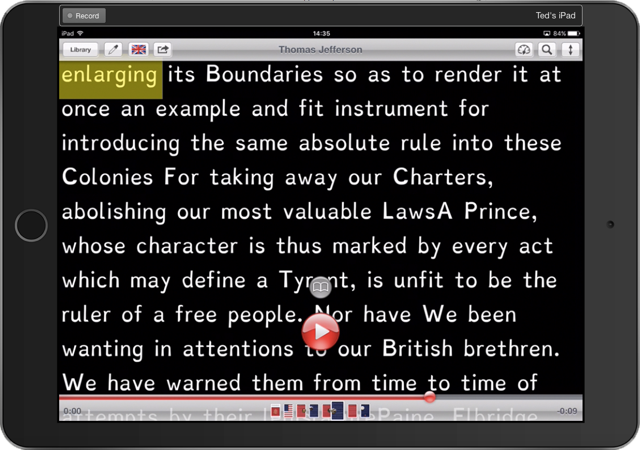 Text-to-speech also works in Text mode, and again with optional highlighting and easy control over reading speed. Although this is app is excellent value for money, I do have one or two gripes. The most significant of these is that it resets zoom to fit a whole page into the screen width with each page turn (with or without text-to-speech running). Another would be the previously mentioned lack of automatic language switching within a document. Like many assistive technologies aimed at dyslexic readers and those with other print disabilities, vBookz PDF Voice Reader for iOS does not read PDF tags. This fact underscores yet again the importance of PDF accessibility professionals going beyond tagging in order to ensure that the large number of such assistive technologies are supported. To cite just one example, before a PDF can be said to be accessible you must set its reading order not only in the tags but also in the order panel, and sometimes in the content panel too. The latter is particularly important for graphs, charts and other infographics. If your job is to make PDFs accessible, and if you fail to address these kinds of issues, users of apps like vBookz PDF Voice Reader will find you out.